Congenital heart diseases are a broad set of structural defects in the heart present since birth that manifest from the perinatal period to late adulthood. Owing to specific chromosomal and single gene disorders, patients with CHD usually have significant problems involving other organ systems. A proper history and physical examination, along with an array of investigations, usually are sufficient to reach a diagnosis. While some diseases may resolve spontaneously (fossa ovalis ASD and small muscular VSD can close on their own), most of the children with cyanotic heart disease rarely survive beyond early childhood and hence, necessitate corrective surgical interventions. Are you more of a visual learner? Check out our online video lectures and start your cardiology course now for free! CHD is the most common type of birth defects. About 1% of babies born in the United States every year are born with heart defects. About 25% of babies born with CHD have a severe cardiac lesion that warrants surgical intervention. 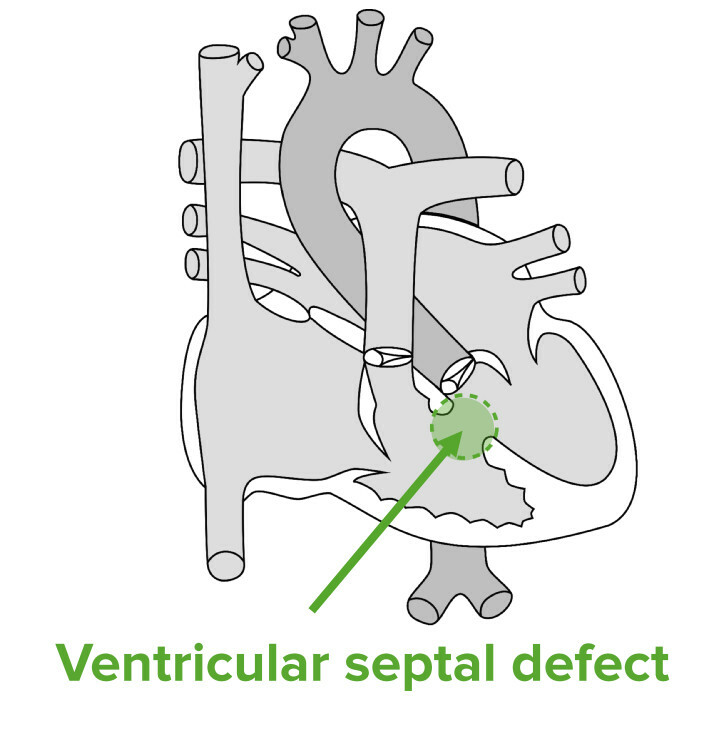 The most common type of CHD is a ventricular septal defect. CHD are abnormalities due to faulty development during 3 – 8 weeks of intrauterine life. Both hereditary and environmental factors play a role in its etiology. Pressure = Flow X Resistance. For systemic pressure, peripheral resistance is taken, while, for pulmonary arterial pressure, the obvious pulmonary vascular resistance is important. A left to right shunt would result in an increase in pulmonary artery blood flow as seen in ASD, VSD and PDA i.e. where an extra communication between systemic and pulmonary systems exist. Since the resistance offered remains the same or may even fall, the increase in flow is not associated with an increase in pressure. Owing to distensibility of the pulmonary artery, large volumes of blood can flow without an increase in pressure; thus, large left to right shunts can exist without an increase in pressure. The increased flow through the pulmonary valve gives rise to murmurs and predisposes the child to frequent chest infections due to the engorged pulmonary vasculature. Both are sub-components of acyanotic heart disease and can be well differentiated clinically. As the name suggests, left to right shunts before the tricuspid valve or at the atrial level are pre-tricuspid shunts, for example in ASD. At birth and during early infancy, the right ventricle being relatively stiff results in a small shunt. As the child grows, the ventricle expands and so does the pulmonary vasculature to accommodate the increasing amount of blood flow; hence, symptoms of pulmonary over-circulation seldom become a part of the history of a child with ASD. Larger flow through tricuspid produces a diastolic murmur, while an ejection systolic murmur is the result of excessive blood ejected into the pulmonary artery from the right ventricle. Post-tricuspid shunts are at the ventricular level (VSD) or great arteries (PDA) where pressure gets directly transmitted from systemic to pulmonary circuit. The shunting of oxygenated blood from the left to the right ventricle begins in the early systolic period. When the defect is small, there is a high-pressure gradient resulting in a continuous pansystolic murmur palpable as a thrill. Hypoxia and exertional dyspnea are consequences of mixing of blood while frequent chest infections occur due to the overloaded pulmonary vasculature. 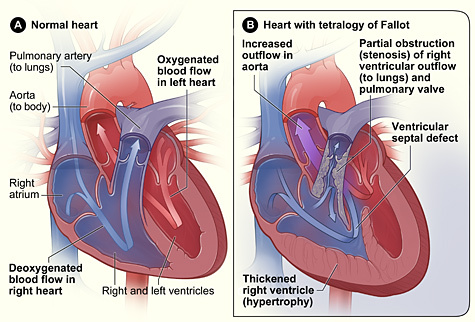 The best example of VSD-PS physiology is Fallot’s tetralogy. 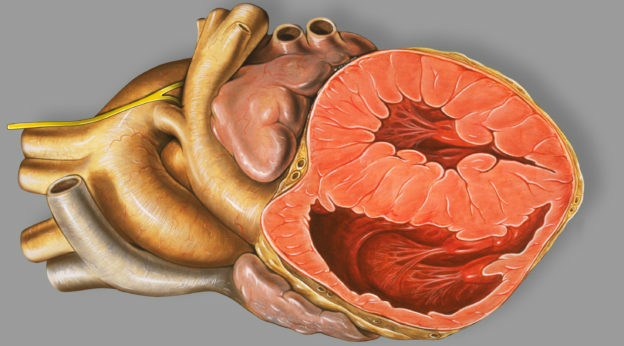 Here, a large ventricular communication is present, along with obstruction to pulmonary blood flow of varying degrees. The obstruction may be infundibular, valvular, annular or supra-valvar stenosis. There is equalization of ventricular pressures on both sides owing to free communication. The more severe the PS, the less is the amount of blood flow through pulmonary arteries and the lower is the amount of the oxygenated blood returning via pulmonary veins; hence, the more severe is the cyanosis. Pink TOF is the least severe form of TOF where PS is significant enough to result in large pressure gradient across the right ventricular outflow tract, but not severe enough to impede pulmonary blood flow; hence, there is often no history of cyanosis. The clinical features are usually easy to decipher from the underlying pathology we studied above. Fossa ovalis ASD: Located in the central portion of atrial septum at foramen ovale. 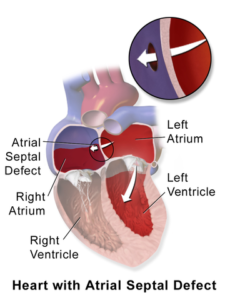 Sinus venosus ASD: At the junction of the superior vena cava and right atrium. Ostium primum ASD: In the lower part of the atrial septum. Coronary sinus ASD: A rare communication between the coronary sinus and left atrium. 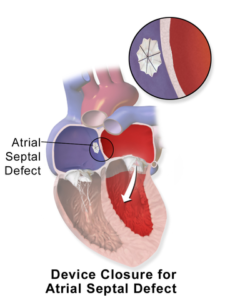 The International Pediatric and Congenital Cardiac Code (IPCCC) defines atrial septal defects as a congenital cardiac malformation in which there is a hole or pathway between the atrial chambers. Because not all communications between the atrial chambers are due to true atrial septal defects, the term interatrial communication is preferred per the IPCCC guidelines. Some children might develop a mild respiratory infection. Heart failure is rare. Complications develop late in adulthood and include pulmonary hypertension, stroke. Parasternal heave owing to an enlarged right ventricle. Ejection systolic murmur from pulmonic valve because of increased blood flow. Soft delayed diastolic rumble due to increased flow through the tricuspid valve. Due to increased venous return, there is overload of the right ventricle, which prolongs the time for emptying. This explains the delayed P2 auscultated here. Small VSD: Left to right shunt continues to be pansystolic, but the second sound is normally split with a normal intensity P2. It is marked by an absence of delayed diastolic mitral murmur. Very small VSD: It often becomes a cause of ejection systolic murmur in young infants. Mostly, it resolves on its own. Large VSD: the difference in systolic pressures of the ventricles decreases, thereby producing a rather softer and shorter left to right shunt murmur, as an ejection systolic murmur. 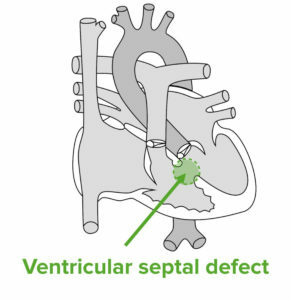 The IPCCC defines ventricular septal defects as a congenital cardiac malformation in which there is a hole or pathway between the ventricular chambers. Other synonyms that can be used in place of ventricular septal defects include interventricular communication and interventricular septal defects. VSD manifests itself at around 6 – 10 weeks of age in the form of congestive cardiac failure. Palpitation, dyspnea on exertion and frequent respiratory infection also may occur. Hyperkinetic precordium with a systolic thrill. The first and second sounds are often difficult to auscultate due to a pansystolic murmur. The second sound (though widely split and variable with accentuated P2) can, however, be heard at the second ICS. The preferred term by IPCCC is patent arterial duct. It is defined as a congenital cardiovascular defect in which the arterial duct (ductus arteriosus) is open beyond the normal age of spontaneous closure. In the most recent commentary by the IPCCC, they mention that it is important for the pediatric cardiologist to know that the site of origination and insertion of the ductus arteriosus can be variable. Around 6 – 10 weeks of age, patients may develop congestive cardiac failure. A history of effort intolerance, palpitations and frequent chest infections. Wide pulse pressure owing to the leaky flow from the aorta to the pulmonary artery. Accentuated S1 while S2 is narrowly or paradoxically split. Continuous murmur with a peak at second sound is an important distinguishing factor, best heard at second LICS. 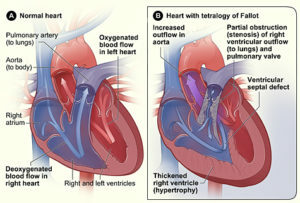 The IPCCC defines tetralogy of Fallot as a group of congenital cardiac malformations that affects biventricular atrioventricular alignments or connections, antero-superior deviation of the outlet septum, narrowing or atresia of the pulmonary outflow, a ventricular septal defect of the malalignment type, and a biventricular origin of the aorta. May become symptomatic any time after birth. Anoxic spells in neonates and infants, after waking up or exertion. The child starts crying, turns blue and may lose consciousness. Dyspnea on exertion and exercise intolerance. Typical squatting position by the patient when they feel dyspneic. A general examination reveals cyanosis and clubbing. Prominent ‘a’ waves on JVP. Cardiac examination reveals a normal S1 and S2, but an ejection systolic murmur is heard too. The IPCCC define tricuspid atresia as a congenital cardiovascular malformation that is characterized by the absence of the tricuspid valvar annulus or an imperforate tricuspid valve. Depends on pulmonary flow: 90% cases have diminished flow with a clinical picture similar to TOF. Prominent ‘a’ wave on JVP. Enlarged liver with presystolic pulsations. Unusual cyanotic heart disease with decreased pulmonary blood flow owing to an abnormality of the tricuspid valve. The IPCCC defines the condition as a congenital cardiac malformation of the tricuspid valve and the right ventricle with downward displacement of the functional annulus of the tricuspid valve. The effect of the structural anatomy on cardio-physiology is decreased pulmonary blood flow. History of turning blue, effort intolerance and fatigue. Cyanosis – slight to severe, clubbing, dominant ‘v’ wave on JVP. Cardiac examination reveals systolic thrill on left stern all border. The first sound is split, but the tricuspid component is discrete, resulting in a single, normal S1. Triple or quadruple sounds heard owing to kid systolic click by the valve. The IPCCC prefers the term “transposition of the great arteries”. It is defined as a congenital cardiovascular malformation in which the morphologically right ventricle connects to the aorta and the morphologically left ventricle connects to the pulmonary artery. Rapid breathing in neonates with congestive failure secondary to hypoxia (poor mixing of blood due to interarterial communication). Normal S1 with single S2 and an insignificant ejection systolic murmur. 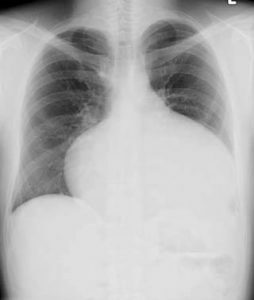 This is a congenital cardiovascular malformation in which none of the pulmonary veins connect to the morphologically left atrium. The onset of congestive failure is usually 4 – 10 weeks of age. Irritable babies with a failure to thrive. Hyperkinetic precordium with normal S1, but widely split and fixed S2. Marked by severe cyanosis and heart failure at 1 – 2 weeks of age. Parasternal heave with normal S1 and accentuated P2. A plethora of investigations are available, but corroboratory clues towards diagnosis can usually be made on X-ray, ECG and echocardiogram. An enlarged right side of the heart is found in diseases with right atrial and ventricular hypertrophy like ASD, TGA, TAPVC and Ebstein anomaly. A normal sized heart is seen in TOF. VSD, PDA and tricuspid atresia are marked by a left ventricular type of cardiac silhouette. Pulmonary plethora is a feature of ASD, VSD, PDA, TGA and non-obstructive TAPVC. TOF, PDA and tricuspid atresia have olive mic lung fields. “Coeur en Sabot” in TOF due to the absence of pulmonary artery segment. “Egg on side” appearance in TGA. “Figure of 8” in TAPVC. Right axis deviation is seen in ostium secundum ASD, TGA, VSD with PS or PAH, TAPVC, TOF and Ebstein anomaly. Left axis deviation is seen in ostium primum ASD, large VSD, PDA and tricuspid atresia. Deep Q waves with tall T waves in left chest leads are indicative of PDA. Inverted T waves are seen in TOF. ECG showing prominent P waves with tall R waves and broad S wave in V6 suggests strongly of Ebstein anomaly. It is diagnostic for most diseases and a useful tool to frame management for the patient as it can accurately detect the defect and its size and site, outline valves and allows decision regarding the suitability of catheter closure. To assess if a heart defect is present, Nada’s criteria has been devised. The presence of one major or two minor criteria are taken to indicate the presence of heart disease. PDA (recognized by its continuous murmur). Aorticopulmonary window (differentiated by special studies). Truncus arteriosus (young age of the patient and severe respiratory distress). Sinus of Valsalva fistula (sudden onset and location of the murmur). It is important to differentiate between ostium primum and ostium secundum ASD. Both present with right ventricular hypertrophy with atrial septal defect. The secundum type and partial anomalous venous drainage usually lack severe symptoms. The primum type and atrioventricular communis reveal apical systolic murmur. Atrioventricular communis causes early severe symptoms, pulmonary hypertension, and the child usually does not survive beyond 4 years of age. PDA and VSD are differentiated on the basis of the murmur found in each and the presence of thrill in VSD. Surgery is still the best option for definitive or palliative treatment for CHD. They may be open or closed operations, but the duration of exposure to cardiopulmonary bypass and cross-clamp time are the major determinants of morbidity associated with surgery. Small defects (<8mm) are to be observed for spontaneous closure. Most defects can be treated percutaneously, while others may require surgical closure. Medical management to control congestive heart failure, repeated chest infections, anemia and infective endocarditis. Surgical treatment is done if large left to right shunt, heart failure occurs in infancy, and associated PS. Can be closed with a patch as early as a few months after birth. For muscular defects in older children, catheter closure can be done. Catheter-based coil or device closure for most patients. Surgery performed for small infants with large ducts. Oral beta blockers for prevention of cyanotic spells. Definitive surgery: closure of VSD and relief of RVOT obstruction in young infants. Arterial switch operation is done for all infants. Atrial switch operation (Senning operation) for TGA with intact ventricular septum. PGE1 can help reduce cyanosis by keeping PDA open.